Summary: This is a continuation of a cooperative study begun in 2009 at Rookery Bay National Estuarine Research Reserve. 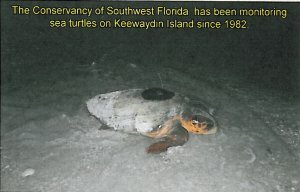 The subjects for this study are loggerhead turtles with documented long-term histories of remigration and inter-annual nesting events on Keewaydin Is. The intent is to satellite tag a suite of inter-season remigrant turtles over a period of 5 years to determine if they use similar migratory routes to return over successive reproductive seasons. This research will also identify their foraging areas and determine if they return to the same locations from nesting season to nesting season. Further, the data from this effort will augment existing data on post-nesting movements from other Gulf of Mexico (GOM) nesting beaches. It will also broaden our knowledge regarding areas in the GOM that are foci of inter-annual foraging as well as enhance our ability to more fully assess risks from commercial Gulf fisheries. This data has added relevance due to the potential form long-term impacts from the recent BP oil spill. The first tracked turtles are expected back in 2011. We will have 4-6 tags so that we can retag them should all 4 return. The added 2 tags plus any not used on the previously tagged turtles will allow us to tag additional animals and to continue this study for its intended 5 nesting seasons. Results: This is summary covers the third year of a cooperative five year study of the inter-annual movements of a suit of loggerhead turtles with documented long-term histories of remigration and inter-annual nesting events on Keewaydin Island, Florida. The principal investigators are Dave Addison The Conservancy of SW FL’s Science Dept. and Dr. Katherine Mansfield, Affiliate Faculty at Florida Atlantic Univ. and National Academies Postdoctoral Research Fellow based at NOAA’s SE Fisheries Center. The objective of this research is to satellite tag a suite of inter-season remigrant turtles over a period of 5 years to help us identify their foraging areas and determine if they return to the same locations over the same general migratory routes from nesting season to nesting season. Further, the data from this effort will augment existing data on post-nesting movements from other Gulf of Mexico (GOM) nesting beaches. It will also broaden our knowledge regarding areas in the GOM that are foci of inter-annual foraging as well as enhance our ability to more fully assess risks from commercial Gulf fisheries. This data has added relevance due to the potential form long-term impacts from the recent Deep Water Horizon Oil Spill. Nine of the 11 turtles tagged in 2011 were remigrants (SCL range=91.2‐106.7 cm), which had been flipper tagged on the Keewaydin beach in previous years: 1987, 1988, 1995, 1998, 2000, 2003 (3 turtles), 2005, and 2011 (2 neophyte turtles with no tag scars). As of this writing (May 2, 2011), five of the 11 tags are still transmitting. All of the turtles have dispersed and settled into their foraging areas. To date, none have shown any sign of moving elsewhere. One of the 2011 turtles, Emily, was previously tagged remigrant from 2009. After she finished nests she returned to the same foraging area she migrated to after the 2009 nesting season. We have know Emily since 1988, and she has now returned to nest on Keewaydin Island on ten occasions. Her fidelity to her nesting beach and her Bahamian foraging area is indeed remarkable.